Dell's 2016 monitor lineup includes a stunning OLED display, InfinityEdge bezels, and wireless phone charging. Let the 4K OLED monitor wars begin. Dell formerly unwrapped its first OLED panel Wednesday morning at the Consumer Electronics Show in Las Vegas. Promising true black levels, off the hook contrast levels, and gorgeous colors, the Dell UltraSharp 30 UP3017Q brings the OLED magic at a price that’s actually a bargain for an OLED UltraHD 4K panel—it’s $4,999. 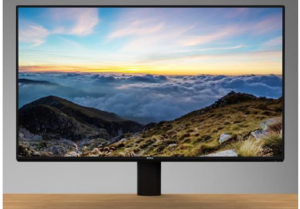 That may seem like the price of a used car, but when you consider the only other 30-inch UltraHD 4K panel that we know of is the studio-grade Sony BVMX300 at $18,000, maybe it’s not so bad. To be fair to Sony, its panel is an HDR monitor. Dell’s new UltraSharp is an almost affordable OLED monitor that pushes UltraHD 4K resolution and supports charging laptops through USB-C too. The Dell is certainly no slouch though. It can display 1.07 billion colors, has a 400,000:1 contrast ratio and response time of 0.1ms. The UP3017Q is rated at 100 percent of the AdobeRGB color space and can hit 97.8 percent of the DCI-P3 color space. DCI-P3 is the color space used exclusively for cinema today. Unlike conventional monitors that use LEDs or fluorescent tubes to light them, organic light emitting diodes or OLEDs create their own lighting. This allows OLED displays to be thinner and smaller while offering superb black levels and contrast levels. OLEDs have been in use in phones for years and high-end televisions more recently, but so far haven’t dipped to consumer displays. You can argue consumer OLED displays still haven’t, since the UP3017Q isn’t aimed at gamers or casual users. Dell expects it to mostly cater to professionals. The company said it has built in special features to compensate for two weaknesses of OLED. The first is image retention, where a static image that has been on the screen too long “burns in” to the screen. Dell said the UP3017Q uses a pixel-shifting feature to reduce the chance of burn-in. The other problem with OLED panels is a shorter life span due to the organic layer breaking down over time. Dell said the UP3017Q features a “presence” detector to tell when you’re in front of the monitor or not, and switch off the display when you aren’t. It’s not just about the fancy OLED screen, though. Dell said it has integrated USB-C Power Delivery into the new monitor so you can run the display and power your laptop through a single USB-C cable. If you’re still champing at the bit to see just how gorgeous this OLED looks on your desk, you’ll have to wait a bit longer. The new Dell OLED panel won’t go on sale until March 31. The 24-inch UltraSharp has a 5.3mm bezels on the top and sides. Dell’s OLED panel isn’t the only new display the company is pushing. Dell said it has also declared war on thick bezels and has brought its InfinityEdge thin bezels to two monitors. The first InfinityEdge panel is the UltraSharp 27 with a resolution of 2560x1440. The bezel measures 7.3mm on the top and sides and 8.3mm on the bottom. Inputs include HDMI 1.4 with MHL 2.0, DisplayPort 1.2, miniDisplayPort, and DisplayPort Out. The monitor is priced at $719 and will be available at the end of next month. 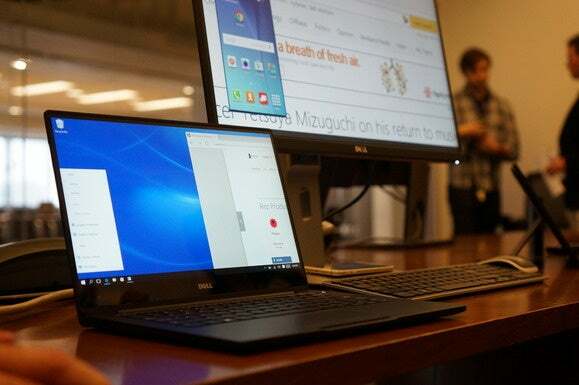 Dell didn’t say what the panel technology is, but as it’s described as “ultra wide viewing” angles, we’d guess that means it’s an “IPS-like” screen. Monitor companies have been hesitant to throw the term IPS around lest they draw the legal wrath of Sharp these days. 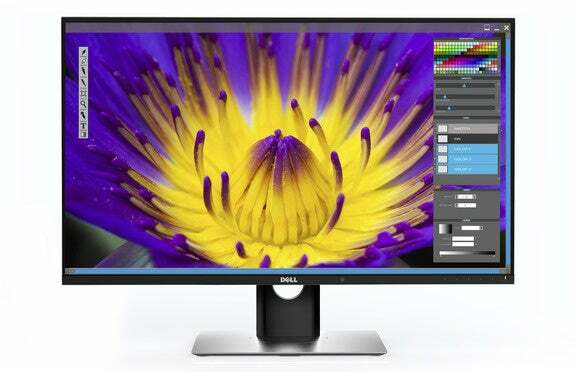 The other InfinityEdge monitor is Dell’s UltraSharp 24. The bezel is even smaller at 5.3mm on the top and sides and 8.3mm on the bottom edge. It has the same inputs as the 27-inch version but the resolution is 1920x1080. It’s priced at $349 and will also be available at the end of next month. The new Dell Wireless monitors let you use Miracast to connect your laptop. 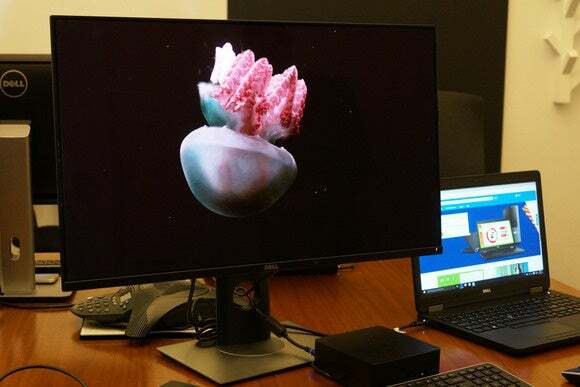 Dell’s two last new monitors support Miracast and Bluetooth wireless display connectivity. 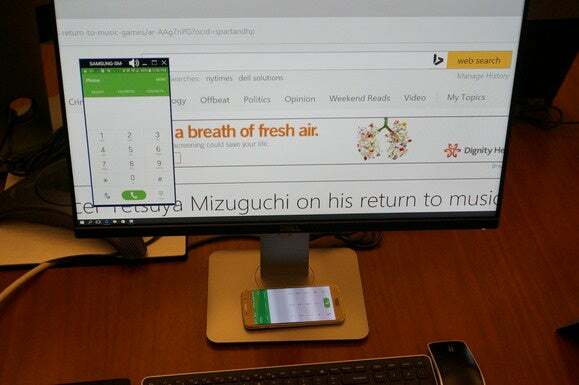 That means you can stream your phone’s screen to your Dell UltraSharp Wireless Monitor without touching it. Laptops that also support Miracast can use the monitor wirelessly as a secondary or primary display. Both are 1920x1080 panels with “IPS-like” wide viewing angle support. The 23-inch UltraSharp Wireless also has a built-in wireless charging base that supports charging tablets or phones that use the Qi or PMA charing standards. Both monitors are limited to a single HDMI port and are priced at $429 for the 23-inch and $469 for the 24-inch monitor. Dell’s 23-inch UltraSharp Wireless lets you wirelessly charge your phone while displaying the contents on your monitor via wireless too.